This week is the start of the first edition of The Big Creative Adventure, a free online event featuring diverse speakers who will be sharing their insights on how to encourage creativity within the family culture. I’m so excited. I’m a huge fan of creative play as you well know and since having kids, nurturing a creative family culture has been an ongoing process for me personally. I’m looking forward to hearing from people around the world about their experiences and advice. The great thing about this summit is that first of all it’s free, and second it’s very accessible. All you need to do is sign up and you’ll get a daily email between the 14th and 22nd of April 2016 with links to all interviews, blog posts and videos of the speakers. Wherever you are in the world, you can go through all of the information in your own time. It’s a resource you don’t want to miss out on and all you need to do is sign up. Easy! Another reason that I’m pretty excited about The Big Creative Adventure is because I’ll be one of the guest writers for the event. I’ve written a comprehensive article about how to get creative with young children, a topic close to my heart. “Young children never cease to amaze me. I love how they move through life, seemingly uninhibited, and just have a plain old go at things. Their innate creativity shines through in all that they do. As parents it’s up to us to nurture that creative mindset. Creativity is of vital importance for healthy child development. Through creative and imaginative play children grow in confidence, independence and resilience. They get to practice social skills, emotion regulation and get to experiment with problem solving and decision making. All these skills are necessary to equip young minds adequately for an unknown future. As I was writing the article I felt like I needed to follow it up with a list of activities that encourage creativity in young children. While all the information and advice in the world can be worth gold, there’s nothing like a straight to it, hands on, go to list to fall back on when you’re in need of some inspiration. I hope this article will be a valuable resource for young families looking for simple play ideas that encourage creativity and they can easily do at home! 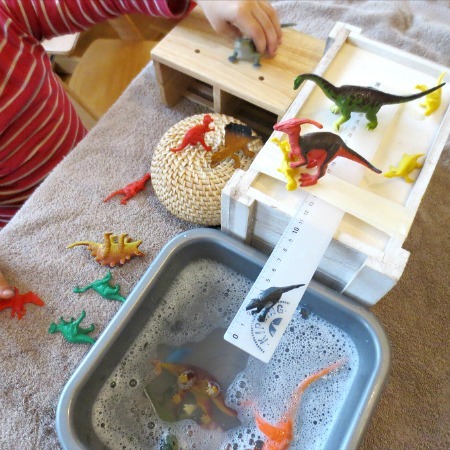 For this round up I have carefully selected activities from a wide range of areas of play like pretend play, construction, sensory and small world play, creative arts and craft and even some STEM projects. For each activity I’ll give you a brief description and a little info on why I believe it will contribute to nurturing creativity in your family culture. All the activities below are especially suited and adaptable for young children or mixed age groups if you have more than one child. You’ll also find that most activities can be easily transferred to the classroom. Now, without further ado: here they are. Enjoy. Simple invitations to play are great for encouraging creativity in young children. They are quick and easy to set up with just about anything you have handy at home. This invitation to play in the mud is genius in it’s simplicity as it combines two things young kids love: mud and loose parts. It’s as inviting and open ended as play gets. If you’re looking for more inspiration for setting up invitations to play or create, have a look here. 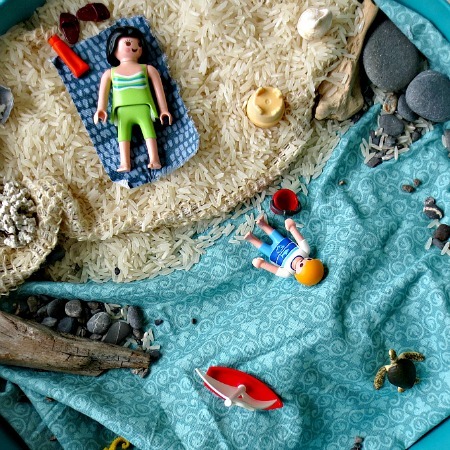 Setting up small worlds with young children is a sure fire way to ignite imagination. You can really tap into a young child’s interests by making it come alive on a small scale. The younger the child, the simpler your small world can be. 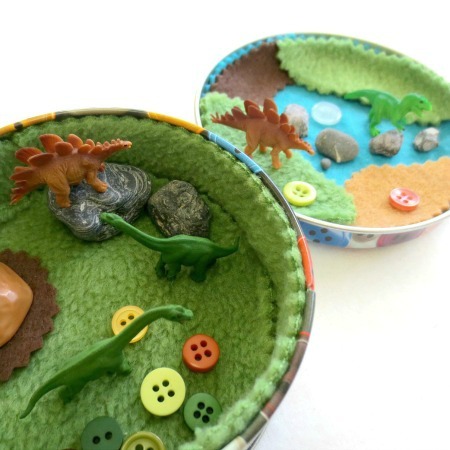 The dinosaur world we set up is a great example of how easy and simple it is to build a small world using every day materials. 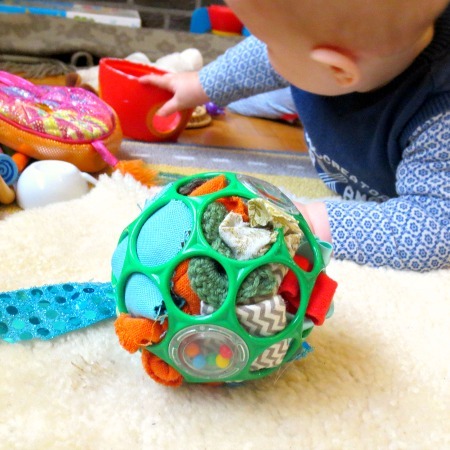 If you’d like to know more about small world play, this is a very popular article that will answer all of your questions and will provide you with lots of inspiration to get started at home. You might wonder why I chose to add a science activity to this list. It’s very simple: I believe that part of being creative is to keep exploring. Learning about new things piques our curiosity and will drive us to experiment, through experimenting we’ll unlock even more creativity. If you haven’t experimented with expanding block play at home, you’re in for a treat. 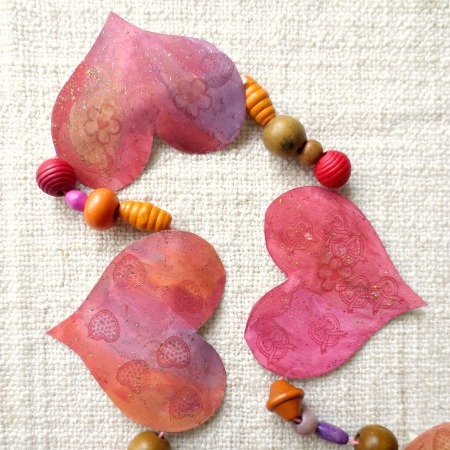 Immediately hop on over to this article by Picklebums and soak in the creative goodness. Block play is crazy popular with young children and adding loose parts to it encourages creativity by providing endless opportunities for exploration. 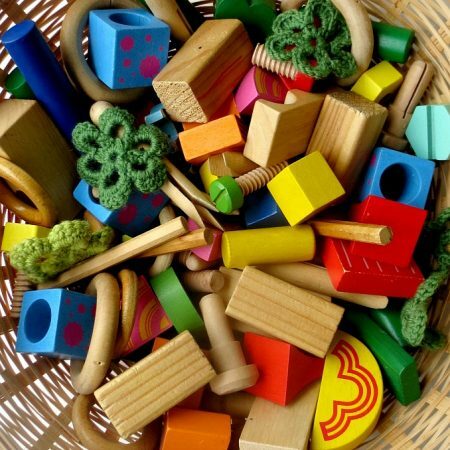 The idea of expanding block play is based on the Theory of Loose Parts, which, if you haven’t heard of it yet, is a must read that will revolutionise the way you look at play forever! Now that we’re talking about loose parts, another way to encourage creativity and imagination in young children through loose parts play is by putting together an inventor’s box. The inventor’s box is the ultimate invitation to create. You can add any kind of material to it that you like and tweak it so it fits your child’s age, ability, interest and so on. It’s a hands on, process focussed activity that is especially popular with preschool aged children. Have a look at how to put together an inventor’s box here and read all about organising inventor’s box play dates here. Making play dough cupcakes is such a sweet and simple way to get creative with young children. Toddlers and preschoolers love playing with play dough and by setting up an invitation to make pretend cupcakes you’re instantly opening that door for creativity to flourish and pretend play will soon follow. All you’ll need to do is say yes please and thank you very much when those cupcakes start coming your way! Play dough in itself is one of those easy go-to mediums and perfectly suited for a wide variety of creative play activities. 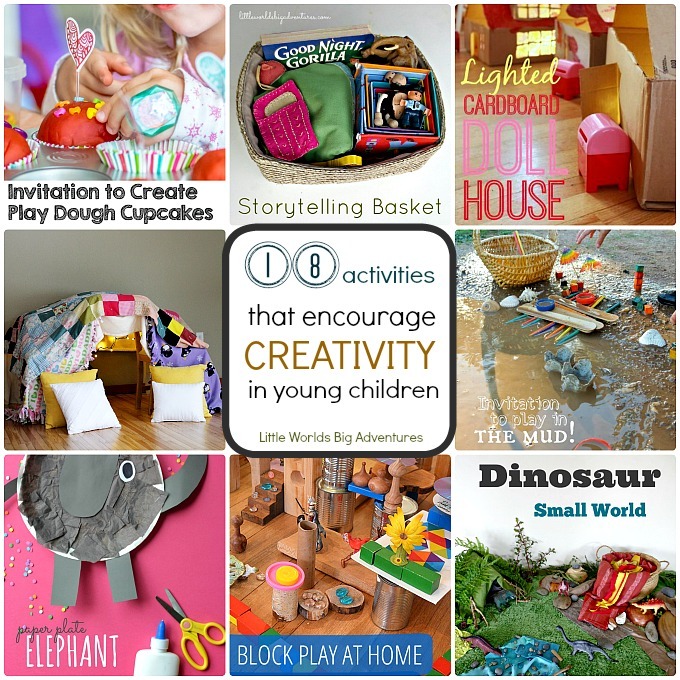 Have a look here for a whole variety of play dough ideas, invitations and recipes. The dollhouse is a childhood classic in imaginative play and could not be left out of the list. The great thing about this activity is that creating the dollhouses is a collaboration between child and parent. In my article about how to get creative with young children I talk about the importance of involving little ones in big projects. Making a cardboard doll house together would be an ideal way to start! And for the youngest ones in the family … heuristic play is the way to go to encourage creativity from a young age. Leave those plastic, brightly coloured, noisy toys be in favour of everyday materials. 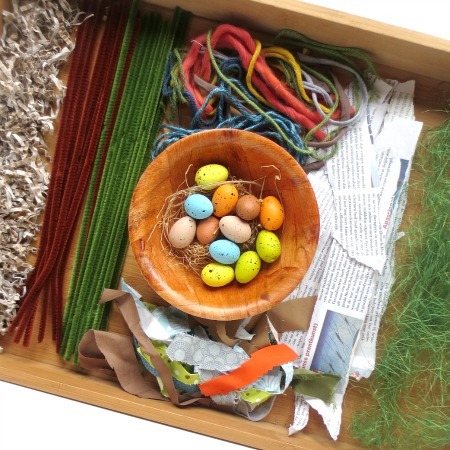 Putting together discovery baskets with everyday things from around the house will provide little children with a much richer experience which will in turn nurture their innate curiosity to figure out the world around them. Treasure baskets can come in any shape or form so feel free to explore and figure out what works best for your child in whatever age or stage he or she is in. 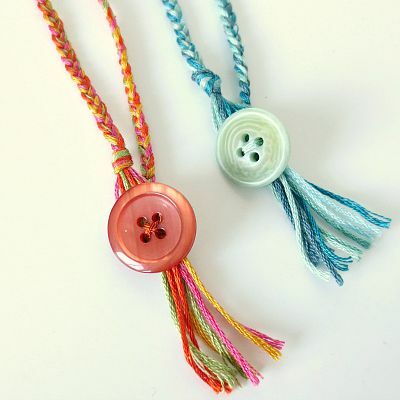 Simple art and craft activities are great ways to encourage creativity in young children. They love playing around with different materials, practising certain skills and learning new techniques. Through art and craft activities children get to see and experience first hand how one can create something from nothing. This simple revelation is ground breaking for most toddlers and preschoolers who might not stop cutting, taping, drawing and making random works of art for years to come! There’s nothing more fun for young children than to build a blanket fort. Getting the children involved in building it will encourage creativity and the hours afterwards playing in it will surely get their imagination going. Even for very young children tent, forts, cubbies or just a plain old cardboard box are irresistible. It’s easy activity to set up and provides endless opportunities for creative play. Every family needs to have a dress up box. Pretend play or dramatic play is such an integral part of early childhood that we for the most part instinctively encourage. Quite possibly because it is so cute and entertaining! A dress up box has a way to fill itself up with a random collection of things. This blog post goes over a couple of the basic and might give you some new ideas to change things up a bit. 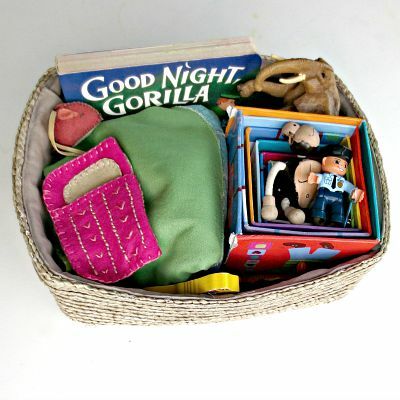 A story basket provides parents and children with the opportunity to further explore the storyline and characters. It allows children to experience the story from a different perspective and gives them the chance to expand on it and even participate in it. This is perfect for children who are really drawn to certain books or songs and want to hear them over and over again. They will thoroughly enjoy hearing, experiencing ad coming up with different creative versions of the same tale. Process art is one of those staple creative activities every child should get a chance to play around with on a regular basis. I love this particular activity because it takes a familiar (and often well loved!) toy, takes it out of it’s regular context and uses it to create art. This is encouraging creativity in young children at it’s best: simple and accessible. There are many ways in which you can encourage creativity through process art, find a whole lot of inspiration right here. This is an activity every parent should do at least once for their children: transform a room or play area into a pretend play world your child is particularly interest in at the time. Then watch those eyes grow big and smiles go wide. Making a fantasy world come to life shifts imagination from the abstract to the real. And in making both ends meet, a whole lot of creativity comes into play. I also think it’s of great importance to show our children that we haven’t forgotten how to play ourselves. So grab a cuppa and go sit down in the doctor’s waiting room for your next appointment. Touching back on the importance of introducing children to new experiences in order to nurture and encourage creativity, sensory bins are just about the perfect medium for young children. Because sensory bins by definition are contained, it’s an easy and safe way to expose young children to new sensations without overwhelming them. 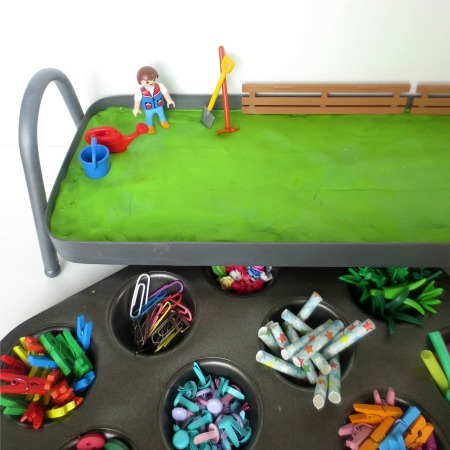 There is a HUGE variety of sensory bin ideas out there for you to draw inspiration from. A good place to start exploring them is here. Nothing engages all the senses like some good old fashioned outdoor play. Nature is the best playground and if anything will ever encourage creativity it’s spending lots of time outside. Take nature play a step further by collecting treasures and bring them inside for further exploration, learning or creating. Activities like making nature portraits are wonderful examples on how to encourage children to see beyond the obvious and open that door to creative thinking. Getting children curious and engaging that innate sense of exploring the world, figuring out how things work is an excellent way to foster creativity. For young children, simple activities as taking apart an old toy is absolutely fascinating. And to be honest, I thought it was pretty fascinating myself. I provides children with an insight that things not always just are but that they were created by someone who, just like them, had an idea one day. Stories capture children’s attention and imagination from the day they were born. It is such a powerful medium in working with children (and adults for that matter!). There are numerous ways to tell a story besides reading out loud to your children, one of those is through story stones. This interactive activity encourages children to come up with their own story and prompt them to build on it. It’s a simple way to encourage creative thinking in little ones and engage the whole family. Everyone will be laughing (or raising eyebrows!) in no time. Since there’s so much more to creative storytelling that I can’t possibly capture in a few lines, I’d encourage you to have a look here for many more ideas. These carefully chosen activities present a wide range of play areas to show you that creativity presents itself in all areas of life. Gone are the days that we thought only people like Gaudi or Picasso were truly creative. We know now creativity shows in the small as well as in the big things. I hope you have fun figuring out where your “creative vibe” as a family lies and that you will never stop exploring nor enjoying!